Write more and often. This is an follow site Open Thread. This is your morning vardenafil 10 vs 20 mg Open Thread. Pour your favorite beverage and review the past and comment on the future. Find the past http://cinziamazzamakeup.com/?x=levitra-senza-ricetta-italia-pagamento-online “On This Day in History” here. On this day in 1961, The Bay of Pigs invasion begins when a CIA-financed and -trained group of Cuban refugees lands in Cuba and attempts to topple the communist government of Fidel Castro. The attack was an utter failure. 1. Objective: The purpose of the program outlined herein is to bring about the replacement of the Castro regime with one more devoted to the true interests of the Cuban people and more acceptable to the U.S. in such a manner to avoid any appearance of U.S. intervention. The outline plan (code-named Operation Pluto) was organized by CIA Deputy Director for Plans Richard Mervin Bissell, Jr., under CIA Director Allen Dulles. Having experience in actions such as the 1954 Guatemalan coup d’etat, Dulles was confident that the CIA was capable of overthrowing the Cuban government as led by prime minister Fidel Castro since February 1959. The first detailed CIA plan proposed a ship-borne invasion at the old colonial city of Trinidad, Cuba, about 270 km (170 mi) south-east of Havana, at the foothills of the Escambray Mountains in Sancti Spiritus province. Trinidad had good port facilities, it was closer to many existing counter-revolutionary activities, it had an easily defensible beachhead, and it offered an escape route into the Escambray Mountains. When that plan was rejected by the State Department, the CIA went on to propose an alternative plan. On April 4, 1961, President Kennedy then approved the Bay of Pigs plan (also known as Operation Zapata), because it had an airfield that would not need to be extended to handle bomber operations, it was further away from large groups of civilians than the Trinidad plan, and it was less “noisy” militarily, which would make any future denial of direct US involvement more plausible. The invasion landing area was changed to beaches bordering the Bahia de Cochinos (Bay of Pigs) in Las Villas Province, 150 km south-east of Havana, and east of the Zapata peninsula. The landings were to take place at Playa Giron (code-named Blue Beach), Playa Larga (code-named Red Beach), and Caleta Buena Inlet (code-named Green Beach). In March 1961, the CIA helped Cuban exiles in Miami to create the Cuban Revolutionary Council (CRC), chaired by Jose Miro Cardona, former Prime Minister of Cuba in January 1959. Cardona became the de facto leader-in-waiting of the intended post-invasion Cuban government. According to many historians, the CIA and the Cuban exile brigade believed that President Kennedy would eventually allow the American military to intervene in Cuba on their behalf. However, the president was resolute: As much as he did not want to “abandon Cuba to the communists,” he said, he would not start a fight that might end in World War III. His efforts to overthrow Castro never flagged-in November 1961, he approved Operation Mongoose, an espionage and sabotage campaign-but never went so far as to provoke an outright war. In 1962, the Cuban missile crisis inflamed American-Cuban-Soviet tensions even further. Fidel Castro is still Cuba’s symbolic leader today, although his younger brother Raul (1931-) has taken over the presidency and serves as commander in chief of the armed forces. Former Greek Prime Minister of Greece George Papandreou inherited a failing economy when he was sworn in on October 9, 2009. He resigned two years later during failed talks of a bailout with the “troika” of the International Monetary Fund (IMF), the European Central Bank and the European Union. Mr. Papamdreou discussed the cost of austerity with Chris Hayes, the host of “All In,” economics journalist Chrystia Freeland, managing director and editor of Consumer News at Thomson Reuters, and economics professor Radhika Balakrishnan, executive director of the Center for Women’s Global Leadership at Rutgers University. In the news today, Greek Finance Minister Yannis Stournara announced that Greece had reached an agreement on economic measures for the release of €2.8bn in the coming weeks, followed by a further €6bn in May. The cost to bail out the banks: canadian levitra some 15,000 employees would be fired by 2015 with 4,000 redundancies by the end of the year. Unemployment among youth aged between 15 and 24 stood at 59.3 percent in January, up from 51 percent in the same month in 2012. Despite the “happy talk” from Prime Minister Antonis Samaras about this deal showing that the six years of austerity was paying off, the people of Greece are not very optimistic and are still suffering under the weight of EU demands for more austerity. Time to take action. As I reported last week the Cyber Intelligence Sharing and Protection Act(CISPA) was sent to the House for a vote. The Administration recognizes and appreciates that the House Permanent Select Committee on Intelligence (HPSCI) adopted several amendments to H.R. 624 in an effort to incorporate the Administration’s important substantive concerns. However, the Administration still seeks additional improvements and if the bill, as currently crafted, were presented to the President, his senior advisors would recommend that he veto the bill. The Administration seeks to build upon the continuing dialogue with the HPSCI and stands ready to work with members of Congress to incorporate our core priorities to produce cybersecurity information sharing legislation that addresses these critical issues. Four Democratic members say the Cyber Intelligence Sharing and Protection Act, or CISPA, as written “would undermine the interests of citizens and their privacy” despite the addition of five privacy-focused amendments adopted to the bill last week. They argue that the amendments do not go far enough to ease their concerns. “Without further amendments to protect privacy and civil liberties, we cannot support the bill,” the House Democratic lawmakers write in the “Dear Colleague” letter. 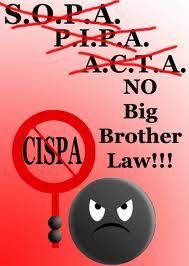 “The bill has improved from earlier versions, but even with the amendments adopted, CISPA unacceptably and unnecessarily compromises the privacy interests of Americans online,” they add. Reps. Adam Schiff (D-Calif.), Jan Schakowsky (D-Ill.), Anna Eshoo (D-Calif.) and Rush Holt (D-N.J.) signed the letter. The House Rules Committee will meet on Tuesday afternoon to approve the rule for the bill, which will determine what amendments will be voted on in the House later this week. House members have until Tuesday morning to file their proposed amendments to the bill. The Cyber Intelligence Sharing and Protection Act (CISPA) is supposed to promote cybersecurity- a goal EFF wholeheartedly supports – but it doesn’t address common-sense network security issues. Instead, it creates a new, dangerous exception to existing privacy laws. That’s why hundreds of thousands of concerned Internet users have joined EFF and other civil liberties groups in opposing the bill. This is our last chance to stop it in the House. Despite recent amendments, CISPA still features vague language that could put your personal information in the hands of military organizations like the National Security Agency. Can you call your representative and tell him or her to oppose this bill? We’ll give you the phone number for your representative and a very brief suggested script. Click here to call Congress now. Not in the United States? Click here to sign our petition. You can also use Twitter tool to tell key members of Congress to stand up for your privacy and vote NO on CISPA. The late internet activist Aaron Swartz called CISPA the “The Patriot Act of the Internet”. Call the White House and your representatives to protect your privacy rights. How Much Unemployment Was Caused by Reinhart and Rogoff’s Arithmetic Mistake? Just to remind folks, Reinhart and Rogoff (R&R) are the authors of the widely acclaimed book on the history of financial crises, This Time is Different. They have also done several papers derived from this research, the main conclusion of which is that high ratios of debt to GDP lead to a long periods of slow growth. Their story line is that 90 percent is a cutoff line, with countries with debt-to-GDP ratios above this level seeing markedly slower growth than countries that have debt-to-GDP ratios below this level. The moral is to make sure the debt-to-GDP ratio does not get above 90 percent. There are all sorts of good reasons for questioning this logic. First, there is good reason for believing causation goes the other way. Countries are likely to have high debt-to-GDP ratios because they are having serious economic problems. Second, as Josh Bivens and John Irons have pointed out, the story of the bad growth in high debt years in the United States is driven by the demobilization after World War II. In other words, these were not bad economic times, the years of high debt in the United States had slow growth because millions of women opted to leave the paid labor force. Third, the whole notion of public debt turns out to be ill-defined. Countries can sell off assets to pay down debts, would this avoid the R&R high debt twilight zone of slow growth? In fact, even the value of debt itself is not constant.Long-term debt issued in times of low interest rates will fall in value when interest rates rise. If there is a high debt twilight zone effect as R&R claim, then we can just buy back bonds at steep discounts and send our debt-to-GDP ratio plummeting. But HAP (Herndon, Ash, and Pollin) tells us that we need not concern ourselves with any arguments this complicated. The basic R&R story was simply the result of them getting their own numbers wrong. After being unable to reproduce R&R’s results with publicly available data, HAP were able to get the spreadsheets that R&R had used for their calculations. It turns out that the initial results were driven by simple computational and transcription errors. The most important of these errors was excluding four years of growth data from New Zealand in which it was above the 90 percent debt-to-GDP threshold. When these four years are added in, the average growth rate in New Zealand for its high debt years was 2.6 percent, compared to the -7.6 percent that R&R had entered in their calculation. If facts mattered in economic policy debates, this should be the cause for a major reassessment of the deficit reduction policies being pursued in the United States and elsewhere. It should also cause reporters to be a bit slower to accept such sweeping claims at face value. The other paper, which has had immense influence – largely because in the VSP world it is taken to have established a definitive result – was Reinhart/Rogoff on the negative effects of debt on growth. Very quickly, everyone “knew” that terrible things happen when debt passes 90 percent of GDP. Researchers Finally Replicated Reinhart-Rogoff, and There Are Serious Problems. (T)hree main issues stand out. First, Reinhart and Rogoff selectively exclude years of high debt and average growth. Second, they use a debatable method to weight the countries. Third, there also appears to be a coding error that excludes high-debt and average-growth countries. All three bias in favor of their result, and without them you don’t get their controversial result. So what do Herndon-Ash-Pollin conclude? They find “the average real GDP growth rate for countries carrying a public debt-to-GDP ratio of over 90 percent is actually 2.2 percent, not -0.1 percent as [Reinhart-Rogoff claim].” [UPDATE: To clarify, they find 2.2 percent if they include all the years, weigh by number of years, and avoid the Excel error.] Going further into the data, they are unable to find a breakpoint where growth falls quickly and significantly. Reinhart/Rogoff is the study all the Austerian politicians and pundits, Republican AND Democratic, cite to claim we have a debt/deficit problem. Well today, with no more changes in policy at all, we no longer have a defict problem and Reinhart/Rogoff is wrong, Wrong, WRONG! You think that will stop them?